A popular and classic Chinese takeaway dish, this Chicken Noodles with Hoisin Sauce is great for quick meal, anytime, anyday. 1. Transfer the chicken pieces to a large bowl. 2. Mix the soy sauce, hoisin sauce, rice wine and ginger in a bowl. 3. Add half of the sauce to the chicken and mix well until evenly coated. 4. Cover and keep aside for 10 minutes. 5. Heat little oil a grill pan over medium flame. 6. Add the chicken pieces and cook for 5 minutes or until cooked through, turning once or twice. 7. Cook the noodles as per packet instructions. 8. Towards the end, add the carrots and stir well. 9. Drain, rinse with hot water and drain again. 10. Add the noodles with the carrots to a bowl. 11. Add the spinach leaves and toss well. 12. Add the cooked chicken and drizzle over the remaining marinade. 13. Garnish with the spring onions. 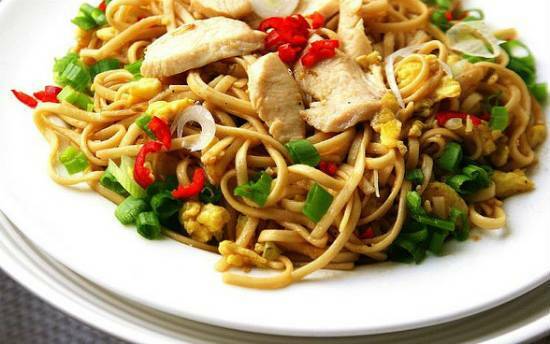 Feel free to comment or share your thoughts on this Chicken Noodles with Hoisin Sauce Recipe from Awesome Cuisine.